On corner of Hitchcock Cemetery Rd and Beulah Hwy. From the Hancock County Courthouse, go east 2 blocks (0.2 mile) to Boland Street. Turn right on Boland Street (which eventually becomes Linton Rd) and go about 8-1/2 miles to the Linton - Beulah Highway split. Bear right on Beulah Highway and go 2.7 miles to the old home place on the left, just before you reach the intersection of Hitchcock Cemetery Rd and Beulah Highway. 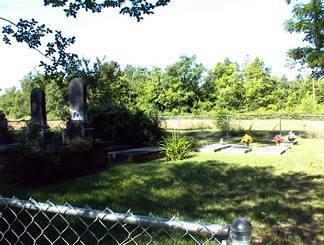 The cemetery is behind the house and is in the southeastern corner of the intersection formed by county roads #220 and #218 (Hitchcock Cemetery Rd and Beulah Hwy). Fenced -- good condition. Some markers blank but not shown in cemetery listing. "We'll join thee in that heavenly land no more to take the parting hand." "Rest Mother -- rest in quiet sleep, while loved ones in sorrow o'er thee weep." "A precious one from us has flown a voice we loved is stilled. A place is vacant in our home which never can be filled."